New Zealand is a long way from the rest of the world. It takes three to four hours to fly from Auckland to the big eastern Australian cities; over half a day to reach the US West Coast or Southeast Asia; and most of a day to reach Europe. Our geographic isolation has advantages – for instance, it’s easier to manage biosecurity controls to protect our local environment and agricultural exports – but also many economic costs. As the gravity model of trade predicts, countries that are further away from each other tend to trade less. In other words, our distance means that we aren’t selling as many goods and services to Europeans, Asians, Americans, and other people in general as we could, given New Zealanders’ relatively high skill and education levels, propensity to innovate given the right incentives, and generally reasonable policy settings. And, equally, we’re not buying as much from them as we could. First, exporting less means that there are fewer opportunities for New Zealand companies to ‘scale up’, which limits their productivity and their ability to successfully innovate. Result: Lower levels of economic productivity and lower incomes. Second, importing less means that many New Zealand businesses operate in ‘niches’ with little competition, which limits the pressure they face to lower prices or improve processes. Result: Higher prices that reduce what we can buy with our lower incomes. The fundamental point remains, however, that all of New Zealand’s regions play a critical role in the country’s exports, so anything that limits the accessibility, and therefore the potential global engagement of these regions, damages the economy as a whole. In particular, the role that New Zealand’s monopolies play in increasing spatial transactions costs of accessing New Zealand’s regions need to be reconsidered. Small markets are notorious for the development of monopolies (Sutton, 1991), and in the current era of globalisation, countries such as New Zealand must ensure that existing monopoly positions in transport and communications markets do not undermine overall competitiveness of the economy. McCann focuses on the cost and difficulty of travelling between New Zealand cities, which is important, but I’d like to look at the challenges of travelling within our cities. In other words, what happens after we arrive at the airport? Let’s take a look at Tauranga, which is growing and close enough to Auckland to be in its orbit. If I was going down there for a day of work meetings, I could drive, but flying would save quite a bit of time without being too expensive. At the time of writing, I could book a round-trip flight in a week’s time for $218. Driving would take three hours each way, compared to a 40 minute flight. The bus route itself is pretty decent – according to Google, it would be almost as fast as a taxi. But look at that 13 minute walk from the airport to the bus stop! Most people would look at that and say: Yeah nah. Things would get harder if I had multiple destinations within Tauranga. Let’s say I had a second meeting across town, or that I was staying the night at my cousin’s place. Given the way that the city is laid out, walking to all the places I want to go would be a challenge. The bus routes probably don’t go to all the places I need to be. And while cycling could be an option, with safe cycling facilities, I probably won’t be able to hire a bike. These are all things that I normally do in other cities that have made it easy. I’m sure other people are the same. Basically, my options are probably to take (comparatively expensive) taxis everywhere or rent a car. That will get me to my destinations, but it means that I won’t see much of the city or have many opportunities to talk to anyone but (a) the people I’m scheduled to meet and (b) the taxi driver. So I’ll probably leave Tauranga without having much of a chance to develop an appreciation or interest in the place, or any opportunities for fortuitous unplanned interactions. That has an invisible cost to the economy: it means less potential for ‘repeat business’ over time. To be clear, I’m not writing this to single out Tauranga. In the New Zealand context, there is nothing unusual about Tauranga, which is precisely the problem. The lack of critical mass and walkability in most commercial centres. Fixing some of these problems without addressing the others is likely to lead to disappointing results. Take proposals for commuter rail between Auckland and Hamilton. I would happily take the train to Hamilton if it was competitive for travel times – in fact, I’ve taken the bus there before. But if I wasn’t able to get around Hamilton without a car once I arrived, I would probably choose to just drive down instead. This would limit the usefulness of commuter rail and limit the degree to which our economy can benefit from it. What do you think about New Zealand’s spatial challenges to achieving higher productivity? There is potential to eliminate a lot of short haul flights if surface transport options are improved. Whangerei, Hamilton & Rotorua to Auckland, Top of the south, Wanganui & Palmerston North to Wellington and Timaru to Christchurch all strike me as pairings where air travel can barely compete with car travel now once checkin, security and travel to airport are factored in let alone what better regional rail could do. Air NZ doesn’t fly Auckland to Hamilton and Christchurch to Timaru anymore and they don’t fly out of Wanganui at all. Turns out they do fly Wellington to Palmerston North a couple of times a day. I’m guessing this is mainly targeted at those with connecting flights. I’ll add to this that Palmy also has a bus that stops right outside the airport terminal. And an inter-city train. The little town that could, eh! Although having recently looked into flights between Auckland and Palmerston North I quickly gave up on the idea when I saw the fares. I wanted to make a weekend visit, there and back, but the flights are prohibitive, driving takes too long and there’s no Sunday train. Sorry Palmy, I never got to know you as you deserve. I’d be doing many more field trips and short holidays by train if the trains were every day. Palmy does NOT have an inter-city train. Once or twice a day does not count. Wellington and Palmerston North airports should be operated as one. On days (like today) when Wellington Airport is closed by wind or fog, inevitably Palmerston North Airport is open. Putting a rail terminal in the Palmerston North Airport would be easier than building a new car park at Auckland Airport. Putting a rail Terminal in Wellington Airport would provide Wellington with much more transport asset than putting four lanes of road through Mt Victoria and Haitaitai and would cause minimal loss of housing. Once that rail connection is built Air NZ could have a checked in Rongotai passenger on a plane at Palmerston North an hour and a half later. Much better than being stuck at Rongotai Airport over night. Lloyd – are you anticipating having a spare fleet of trains stored just for the few days a year that Wellington airport is closed? Or are you thinking regular services that are running sufficiently empty most days they can suddenly move a couple of aircraft full of people if needed. Linking rail to Wellington Airport is exactly what Wellington needs, and a proper inter-city service to Palmerston North is needed even without displaced air-travellers as a consideration. The need for these services go way beyond feeding the airport. The whole of Wellington’s southern+eastern suburbs including main centres such as Newtown and Kilbirnie, and much of the CBD itself, are remote from the spinal regional rail system. Fixing this would obviate (or would have obviated) the need for $billions to be spent on motorways over the same corridor. Unfortunately many in New Zealand find it difficult to lift their gaze above anything but the bare minimum in public transport, while being quite OK about showering money on uneconomic highways. Dave – I wasn’t so much commenting on the WLG – PN rail service, more the idea of having it set up for moving people between the airports. A regular service is unlikely to have the capacity to move a couple of plane loads between the two airports at short notice and if it did you would have to question the viability of the service on a day-to-day basis. By the time you got the passengers to PN Wellington airport would probably be open again, it’s a solution looking for a problem. It’s definitely not what it should be, but it’s one of few remnants of a time when intercity passenger rail travel was possible in NZ. Good article Peter and I agree with your model. WRT the second circle of importance -lower transport costs between (NZ) cities -I think Nelson might be a good case study of the effects of high transport costs. Nelson is the 2nd oldest city in NZ and oldest in the South Island. It has a favourable climate and a good agricultural hinterland. It is geographically located near the centre of NZ. In 1841 Nelson probably expected it would become one of the largest cities in NZ. Events though conspired against that outcome -it is only the 9th largest urban area -about 64,000 people. In provincial times Nelson’s jurisdiction extended down to the Amuri basin which is only a little over 100km from Christchurch. There was a stock route from Nelson -up to Top House (near St Arnaud) -up the Wairau river over a high main divide pass (Island Saddle -1347m), down the wide open Clarence river valley, across another pass (Jacks Pass) down to Hamner Springs and then down the Waiau river valley into the Amuri Basin. Taking this route Nelson is as close to Christchurch as Picton is -it is 100’s km shorter than any other route. In provincial times Canterbury was not interested in connecting to its northern Nelson neighbour -it wanted to connect to the West Coast initially because of gold. The 8.5 km Otira rail tunnel to the West Coast being eventually completed in 1923. Nelson was never connected by rail to the West Coast or Canterbury -this lack of regional connections being a significant reason for its stunted size. It’s not a competitive system though, is it. If truck operations had to pay what train operations have to pay for, they wouldn’t have a look in. Trucking firms know this, which is why they ganged-up to kill the completion of the last 60 odd kms for a rail link to Nelson (source: Voller, Lois; Rails to Nowhere; Nikau Press; 1991 – my interpretation of what is intimated in the book), for example. To upgrade the Clarence/Waiau road to a State highway would probably require a tunnel through Island Saddle to reduce the highest point on the road down to 1200m and remove the steep incline sections so the road could be used in winter months -the tunnel would be about 2km -similar to Lyttleton road tunnel (2km) or Waterview (2.5km). Rail would require a similar length tunnel and a longer tunnel through Jacks pass (860m). It’s a great drive through there when it is open, it is actually about as quick from Nelson to Chch even with the current gravel and 4WD in parts road. I don’t think it would have much of a chance of getting a BCR of greater than one though! Even 1200m would have some serious issues with snow and ice in the winter. Currently the highest point on the state highway network is on the Desert Road, SH 1 is 1,074 metres above sea level. So Wairau/Clarence road would be another 125 m higher but if the road is relatively flat -then measures like gritting and warnings could be effective. In extreme cases the road can be closed which already happens on alpine passes when southerly storms come through. For instance,the Lewis Pass road was closed last night (the last main road connecting the bulk of the south Island with the North Island). If Nelson or Motueka was better connected to Christchurch then that would make a freight operation from Wanganui more viable. Something which one businessman has put a lot of work into already -he claims using the existing road network would save 4 hours for trucks travelling from Auckland to Christchurch. My proposed Wairau/Clarence route would save something like another 2 hours -and make a Nelson/Motueka to Christchurch return truck journey viable. Cost benefit analysis is difficult to assess when bridging a ‘canyon’ -because it induces so much demand -it is hard to estimate what the use will be based on prior transport movements. Having multiple hubs and routes -aides competitiveness and may decrease some of the monopoly characteristics which NZ is prone to. Having multiple routes adds redundancy and resilience to the transport system. No matter how well the Kaikoura transport corridor is rebuilt there will remain a risk that another earthquake will knock it out of action for months/year. An earthquake in Wellington would also be highly disruptive to transport movements between the North and South Islands. The Desert Rd is also a lot further north and has nearby alternatives. It would be a lot of money to spend on extra redundancy, when we have demonstrated we can survive the loss of a major road. It’s a hassle, but that’s what disasters generally are. I agree Wellington is a big risk to interisland transport, I think good redundancy would be Roro capability somewhere like New Plymouth. This Wanganui to Motueka ferry service sounds very dubious to me, I can’t imagine it will be cheap to use. Strictly speaking the highest point on the SH network is actually SH48 at Whakapapa Village, but I get your point as that is not a strategic through route. Excellent post Peter, I’d never really thought about it that way before. I guess Queenstown would be the best of our smaller centres, 15 minute bus frequency from the airport and a very compact walkable town centre. I think this shows that if we get Auckland – Hamilton rail up and running it needs to stop at the underground station in the Hamilton CBD not just the main station at Frankton. Thanks Jezza – glad you found the post thought-provoking. And yes, that’s exactly the conclusion I’d draw for a potential Waikato rail service. Business trips often require taking samples and are often overnight – doubt I could do much work in Tauranga if I had to fly in and out the same day (haven’t checked flight times so if there is a great schedule for the sake of this argument replace with another city). What I mean is you probably need luggage to an extent that it rules out the walking / cycling options. My experience in other countries was to take the hotel bus to the hotel and then dump the bags and prepare for the next days business – you can’t risk being late for an important meeting so usually travel the day before. Choose a hotel where the action is, not one by the airport. Maybe it is hard to generalise a standard business trip – in NZ I can only remember one and we drove to Hamilton; had breakfast; a short but critical meeting; lunch and 2 hr explore Hamilton then drive back in time to beat the Auckland traffic. Your concentric circles is a useful high level concept. Maybe you should consider not a trip to an outlying location but the experience of a business person coming to Auckland. This is the first time I have actually seen a reason for the existence of the CBD. The solutions – travel from Airport to city with bags needs to be fast, clean, frequent and cheaper. Then the CBD needs far more well lit streets reserved for pedestrians – just try to see Auckland through the eyes of a visitor. A range of hotels in the city – not just the pricey ones and a free travelers one day unlimited AT/Hop card (tied in with airlines to prevent abuse). Not just airport; also the Bus terminal too – yes high powered business travelers can and do arrive by coach. One more point – I was a computer programmer and traveled for work in Europe and the USA and Australia and in those days we carried heavy work related bags. That all changed over 20 years ago – coding now done online, a software demonstration in Auckland controlled from Belgium. We still like the human contact so sales and training usually mean face to face with a little video conferencing but will VR change everything? My impression is that there has been a shift over my working life on this: many more people are going to business meetings in other cities and towns and hoping to be back the same day. It could be because both parents are working: it helps family dynamics for Mum or Dad to try to be home to spread the load, at least as often as possible. I’ve done countless one day business trips all around NZ. But mostly between Auckland – Wellington – Christchurch. While sitting at the front of the plane networking I can assure you its not usual, if not even more common that people do this without staying the night. Heidi & Josh: Thanks for your insights. And of course you are right I’ve often been on flights where other passengers were both obviously traveling for business and clearly returning the same day. Your meetings can have had nothing to do with getting recalcitrant computer software working. My line of work required demonstrations where you really had to be on time or lose the business – couldn’t rely on flights being delayed. Similar when I was giving training courses – if the customers staff had all assembled I absolutely had to be in place on time. I’ve worked with lawyers and they might have meetings where very important papers were signed but the odd transport delay didn’t matter much. If you are traveling for a business day trip do you get the time to see the place you are visiting? My point was about any city including Auckland having the ambience for a business person and not necessitating car hire. Good question. I think a lot of the spare time to be had in small towns ends up being a bit “Alain de Botton”-esque, ie you end up looking at interesting stuff even if it’s only interesting because you direct your mind to searching for the interest in it. Always helps if there’s a library or museum to start with, however small. And having a thermos means I can ask for a hot drink at a cafe but then take it and watch a welder working nearby instead of being in a bland cafe… having a clipboard always means someone will stop and talk… and having equipment covered with radioactive labels means you can always hitchhike around. People are just too curious to let the opportunity to ask slip by. I’m sure other odd equipment would work too. Any of the cities, I think there’s plenty to do in a short time. Heidi, I thought I knew how to have fun but now I see I’m just a beginner. Thanks for the tips but they may not work so well for an elderly male. But on the other hand it is easy for me to walk up to anyone and ask questions when I can imagine it far harder for someone younger or female. 🙂 If you’re after more tips on how to have fun, I recommend ‘The Art of Frugal Hedonism’. A short book and very funny. They seem to paint them all, maybe helps stop graffiti? Yes the personalising of spaces by locals in a low-tech way has been shown to reduce graffiti and vandalism. I love that bus stop. The painting is a mood-booster and far preferable to the advertising we have on Auckland bus stops. It continues to baffle me that people don’t realise how much advertising costs us – the companies don’t do it as a public service but as a way to make money from us. I’m guessing if people are prepared to pay $218 for a flight because it is quicker than driving, they are probably OK with spending $30 on a taxi because it is quicker and more convenient than a bus. Agreed – although it can add up surprisingly fast. From my perspective, the key problem is less about cost and more about loss of opportunities to experience a place and gain some appreciation and local knowledge. Personally, I hate taking a business trip and only seeing the inside of the cab and the inside of the meeting room. I get a much better sense of what the place feels like if I can spend a bit of time on the street, in a cafe, or in a bus with other people. That’s also good for the local economy: they give me opportunities to spend money there. That is also worsened by our complicated import requirements. For example you can’t buy a lot of products online though amazon. Because it takes the vendor a lot of efforts to set up import permits, GST, import duty, declarations etc to sell to NZ. The vendor simply back off and decided not to sell to NZ. So to drive competition, our government must simplify the compliance requirement for small business to setup branch in New Zealand. NZ usually is at the top of international lists for ease at setting up a business. I was going to say judging by the number of Australian and international retailers that have set up in NZ compared to NZ retailers setting up overseas that NZ is very easy for them to set up in. Also because of our small size it is easier for them to get national coverage. In fact if it wasn’t for the likes of the Warehouse Group, James Pascoe Group and Briscoes Group then we would pretty much have all foreign retailers. Good points and greater conclusion. I personally am fairly worried avout the feasibility of California’s HSR for this reason. Yes HSR is successful globally but is the transit at each end good enough? Maybe apps are better – neither I nor the children I was meeting at the terminal carry computers with us. Excellent points Heidi. Auckland Airport is pretty poor in this regard (although AT in general could do better with signs etc throughout Auckland). Yes, lack of connectivity between and within cities certainly increases costs in New Zealand. That’s why in many other countries strategic transport links are built, because they given a location advantage. For example, rail to the airport may not have the best BCR, but it increases the advantage of that location. Whether connectivity within a country is improved by more competition, is questionable. In Switzerland, there is little to no competition in public transport (including long distance transport). Rather, concessions are given by the government based on price (where there is a subsidy) and quality (which includes the history of delivery). Participation in national tariffs and network connectivity are part of the basic quality requirements. As a result, Switzerland has one of the best transport systems in the world, and arguably better than other European countries, where there is more competition. Switzerland has a population density about 10 times NZ. That makes a big difference. Compare with the UK where the transport services near London or on the Liverpool to Leeds northern area are far better than say from Durham north. However you are right in pushing for strategic transport links – what is most beneficial to NZ another frigate or a high speed rail Hamilton – Huntly – Auckland? It makes a difference about the sort of transport network you can and do have. But I’m not sure it makes much of a difference in terms of the competition question. In this case, I also compared it to other European countries with similar densities, where passenger transport is based on a competitive model. “Switzerland has a population density about 10 times NZ.” I wonder if this is in part due to the public transport etc planning decisions they have made (note, I have pretty much zero knowledge of Switzerland & it’s history). It’s largely due to the fact the country is entirely mountainous and people only live is small compact valleys. Which in turn interplays with their transport choices. Geography is part of the success of public transport in Switzerland. But it is not necessarily the absolutely dominant factor. Also, a considerable part of Switzerland is not high mountains and valleys. There is considerable evidence that the good connectivity of the mountain areas in Switzerland has halted population decline there, particularly in omparison with the adjacent Italian and French mountain areas. Of course, other policies also play into that. For example, while these mountain areas are just the periphery for France and Italy, they are the cultural heartland of Switzerland and the Swiss would never let the home of Heidi decline. I find it somehow strange that any comparison with another country is immediately dismissed, because of some apparently crucial difference (and every commentator here identifies a different factor). We have to take these differences into account, but they do not negate all comparison. With regard to the competition issue, we could also look at it closer at home. The ideology of competition at all costs has brought about some spectacular failures. Just think of the 1990s public transport model in New Zealand. Some people may think that it was not perfect (or good enough) competition, but it came about due to the belief in competition. Competition can be good in many circumstances and can bring significant benefits, but I think there is a lot of evidence that indicates that an increase in competition does not always lead to better results. The closest to free competition in passenger transport I have ever experienced was in Peru and Bolivia. And I can tell you that passenger transport there is chaotic and hard to use, even for someone like me, who had lived there for some time. Most people use passenger transport there (more than go by private car), but the lack of a coherent network further holds these countries back (of course a lot of other factors are fare more dominant in their lack of economic success). HSR Auckland-Hamilton would cost about 5x what a frigate would cost. The Navy (and military) provide a needed service in protecting our country and interests both at home and abroad. Without them doing that NZ would be seen as a slacker (it already is to an extend that we spend about half per capita that most others do on defense). I would of course love to see HSR (or even just fast standard rail) but I would not put that in a HSR vs military context. I think that the wartime purpose of our frigates is not really to protect New Zealand from attack, but rather to secure our shipping against submarine and air attack. If New Zealand was cut off from resupply and export by ship for an extended period of time, the people and businesses of New Zealand would suffer extreme hardships. Interesting, feel slightly safer now thanks, had to google a couple of acronyms though. Your post indirectly points out just how important roading is in New Zealand and why the RONS programme is highly necessary. I’m not sure where you get 3 hours for a trip between Auckland and Tauranga. If you leave in peak time then yeah that’s probably right but it’s a 2 and a half hour drive the rest of the time. Comparing that with a 40 minute flight is ludicrous. You have to get to the airport either by car or bus in you live in central Auckland. Then at Tauranga you have to collect your bag and make your way to the destination whereas you could simply drive straight there via traveling by car. By air I think you’d be extremely fortunate to get from destination to destination in two and a half hours. When you get to Tauranga you’re not going to see what you want to see on public transport. The inflexibility of PT means that you have to go where the PT system takes you. Making a town cycle/walking friendly doesn’t take you where you want to go. In Auckland the best bits are walking in the Waitakere or Hunua Ranges, the West Auckland beaches like Piha and Muriwai and the beaches north of the metropolis. With our relatively low population putting train lines everywhere is uneconomical and flying will often be on a limited schedule due to a lack of demand. So roading becomes our primary source of connectivity. To reduce the cost it would be nice to see a political party propose to reduce the huge amount of fuel tax that is levied on fuel. So you simultaneously state that we should reduce the fuel tax but also state how important intercity roads are. How do you plan to pay for these roads if you are reducing the fuel tax? Also I struggle to see how a few very expensive, relatively short, high quality roads is really helping connections between cities. While I agree intercity roads are very important in NZ, I would have thought improvements such as curve realignments and increased passing lanes would be more valuable, these of course are limited while RONS are guzzling up available funding (which you want to reduce). Also I’d say 2:30 is optimistic unless you are travelling at night and using the upper tolerance as your speed limit, I think 2:45 is more realistic. Where in Auckland you are starting from makes a big difference, according to google 2:50 from Auckland CBD to Tauranga CBD but for someone like myself that would be starting 30 kms south of the CBD it is well under 2:30. No amount of common sense or evidence based argument is going to part me from my Audi, the RONS are a great investment, they never clog, get me to my beach home faster and I’m not interested in any arguments about denser well connected cities contributing to greater economic returns, just gonna avoid that little chestnut me..
You must be a very important person to own an Audi. They are a kind of over-priced Volkswagen, aren’t they? How did you become royal then? I didn’t vote for you. I drive to Tauranga fairly frequently (leaving from South Auckland) – and only once have I ever done it in less than 2.5 hours. So i would 100% agree with the 3 hours. I’d even say 3 hours is very decent timing. Are you going via Raglan? From West Auckland (not close to motorway) it’s consistently 2 hours 45 minutes off peak. “…. putting train lines everywhere is uneconomical”. Lucky that’s what no one – ever – has proposed. How about the economics of putting gold-plated highways everywhere at the expense of practically everything else? As was mentioned above, duplicating existing highways and especially ones to the middle of nowhere is ill-thought out. There will be some new ones needed but our money should be spent on better bang for our buck; improving the ones we do have and yes, rail as an alternative on some routes, to get more trucks and cars off the road that don’t need to be there. Wait, so you want to build a train line between Auckland and Taurnaga now?!>!>!!? The problem with the RONS programme was that it mostly *doesn’t* do anything for inter-regional connectivity. Waikato Expressway, sure. But most of the rest cost too much for what they’re delivering, while not reaching anything particularly useful. This isn’t a natural law – it’s a policy choice. There are many cities, including small cities, where PT goes to lots of useful places and walking/cycling is a viable option for getting around the best bits. If that’s not true in NZ cities, it’s because we’ve chosen to do things in a different (and, I would argue, less efficient) way. Put it this way: Last year I spent two weeks in Europe, visiting big cities and small towns. I didn’t set foot in a car the entire time – instead, I spent a lot of time in PT and on bikes. If I had done the same thing in NZ, I would have had to rent a car at a cost of $50-$100 per day. That money would have vanished from NZ’s economy because the car and the fuel are imported. In Europe, I spent that money on local goods and services instead. If we want a tourism industry that benefits us economically, why do we build everything in a way that minimises the amount of money visitors have to spend locally? What sort of madness is that? I have to go to Taupo next week. When I was making transport arrangements, it was assumed that I would fly there and back, because I don’t pay for it personally. But I decided to go by bus. It doesn’t take much longer and saves a few hundred dollars (plus I don’t have to try to get to the respective airports in Auckland and Taupo). To me flying in New Zealand often seems a matter of prestige. For business travel, most people would just not go by bus. This creates costs for the whole of society. More efficient land transport lacks quality and scale. In a sense, if we want to be more competitive internationally, it also requires a cultural shift. Well-supported people have to be willing to mix with the poorer folk. In the US, this differentiation based on prestige is even more pronounced. Few “decent” folk would dare to go on a Greyhound coach. I think you are right to some extent – intercity bus travel in NZ is very much targeted at tourists and those that don’t have a car. I have use it occasionally but most of the time if I’m on holiday in the South Island I’d hire a car. However, with business there is also the time is money aspect, especially if travelling by bus is the difference between having to stay overnight or not, which adds costs. If land travel was more viable for business I’m sure we would see bus companies investing in business seating. It wouldn’t surprise me if future Hamilton and Tauranga rail has a business class section. OMG! I wonder if buying one of those tickets means they’ll give you access to a water fountain at the terminal, too. And maybe a clean toilet. You know, luxury stuff. Ha ha. Interesting, they are obviously seeing a market. Tauranga rail would be all business. A modern standard intercity train seat is comparable to business class in a plane to start with, in terms of size, space and legroom. With our loading gauge, I’d hope they look at a 2+1 configuration for seating throughout any intercity trains, 2+2 is pretty tight for long distance. I think they have 2+2 on the Wairarapa trains and the travel time probably wont be that different. I’d go for two classes myself, gives people the choice. Sure by all means have two classes if it works out, but in terms of space and comfort it’d be more like business and first, at least compared to plane and bus cabins. The Melbourne V Lines have a single class, relatively utilitarian but in terms of space and comfort better than flying business. Thinking about your Auckland to Hamilton train example, I wonder if it could be solved with something like the Denver LRT solution to the “last mile problem”. They have contracted with Lyft to deliver passengers to or from the LRT station as part of their ticket price. A similar deal for Hamilton would be a great solution in combination with a quick electric train. How quick could the train be? It is 50km to Pukekohe, at typical urban train speeds that is going to take at best around an hour, even with efficient electrics. After that it is another 80km to Hamilton. An efficient inter-city electric (not high speed rail just a well specced EMU) can do 130km/hr+, so that is 45 minutes. So you could realistically train from Auckland CBD to Hamilton railway station in 1hr 45 minutes. Add 10 minutes via Uber or Lyft and you could get from anywhere in Hamilton to Auckland CBD in under 2 hours. Our Hamilton bus station is literally on top of the underground train station, the rail tracks run past the second biggest interchange at the base, and the route to Auckland takes you through all of the hubs in the Auckland PT network. We don’t need ‘innovative’ solutions, we need to run some sensible bus routes at useful frequency. I will be cheaper and more effective than subsidizing taxi or uber/lyft rides. Yes – there are many solutions to the last mile. PT’s not always going to be the only or best way to do it. 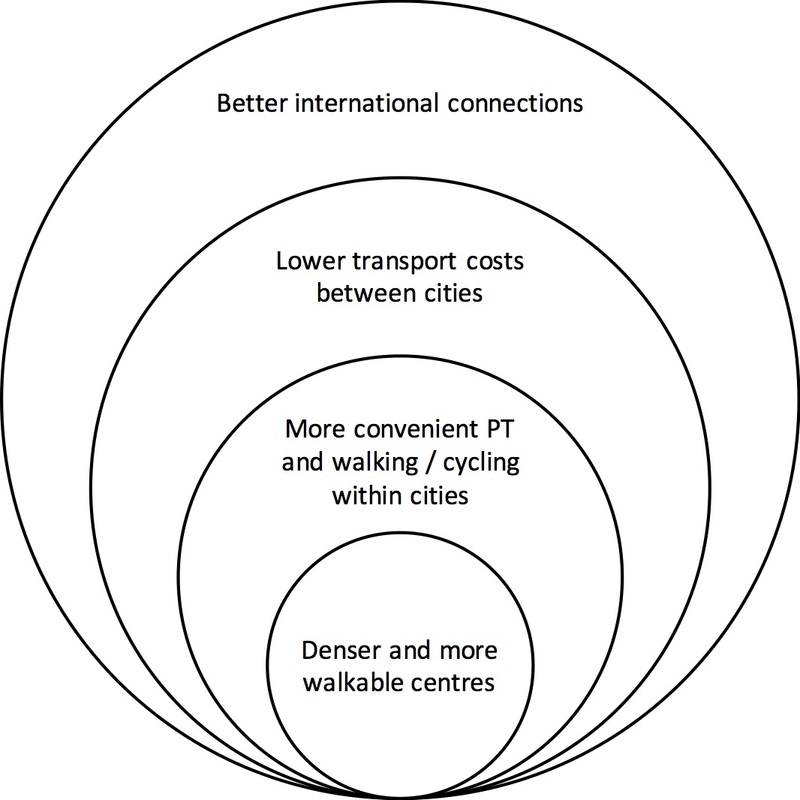 I would highlight the importance of the innermost circle – “denser and more walkable centres” is crucial. One of the ways to fix the last mile problem is to make the last mile really short! In a way, that’s a key issue with Tauranga. Technically, it has a commercial centre but I’m not sure I could point to it on a map – it seems like a strip of low-rise retail and offices that stretches out for ages. So even once I arrived at a given place, I wouldn’t be sure that there would be other stuff around. New Zealand was significantly better off economically when we manufactured locally. We need to import less, and manufacture more, if we want wages to rise back to what they used to be. You could have stopped at simply “manufacture more”. Whether the things we produce are destined for the local market, or export markets, is largely immaterial. What matters is producing goods and services that add value to someone’s lives somewhere in the world. That is what will result in higher wages. NZ’s I.T. industry is a good example of high-value goods and services that are often not destined for the local market. It also minimise the tyranny of distance, which Peter alludes to in his post. We’ve certainly lost our resilience to even minor hiccups in trade. In fairness I think we have always been very exposed to commodity prices, the post wheat and wool boom periods were pretty tough. I’d say we have weathered low dairy prices in the last few years quite well, with tourism and horticulture picking up the slack. Yes. Diverse economies are resilient economies. Tourism in particular appears to be relatively counter-cyclical provided that the negative economic shock is limited to NZ. I’m also a big fan of New Zealand developing software industry as a strategic priority. It seems to leverage our human capital while mitigating the effects of distance. In contrast to buik commodities. Agree, while we have more options now they are still mostly primary industries plus the relatively low wage tourism industry. Software would definitely be a big advantage. I generally agree, although we were helped a lot with preferential access to the British market. I don’t know how well we would go replicating our 1950s and 1960s markets without that. There is no guarantee that if we decided to restrict imports that we wouldn’t find exporting very hard. MFD, We don’t vote for royalty. We don’t vote for donkeys. And I don’t remember voting for Dame Julie either. So maybe Mathew is royal. 🙂 Yip. And if constitutionally we can’t think of anything better, then I don’t think humans are as clever as we all think. Except maybe Mathew is, because he does have an audi. Some of Monty Python’s coconuts might have been donkeys. I was thinking about our very own Sir Donkey and Dame Julie. Our order of merit – neither democratically decided nor politically neutral. Perhaps it’s just about making reality as funny as tv. It’s Audi, with a capital A. Please show some respect, Heidi! As for MP’s coconuts being donkeys…unlikely as IIRC they could (hypothetically), be carried by a swallow. I used to quite like the imagery of coconuts being carried by swallows, whether Amazonian or African. It’s not quite so pleasant when you contract Monty Python to MP. Mathew’s car was a waste of 60k; even he admits to that. I’ll give it a capital only if it’s red. It’s a simple question of weight ratios! A five ounce bird could not carry a one pound coconut. I just don’t see how you can countenance such unfeasible imagery…harrumph. I heartily apologise, what sort of an engineer am I? I was imagining just the coconut shells, not the whole fleshy and milky coconut. In my defence, please understand, I was fooled into this lighter weight imagery by the clip clopping of the k-n-g-hits as they rode along on their ‘horses’ (or donkeys) and which noise I strongly suspected was produced by an advanced cinematographic technique involving coconut shells (not coconuts). BTW, in your orchard, do you grow elderberries? Being a serial blueberry plant killer, I do revel in growing the far better-behaved elderberry shrub, and have a few very useful bags full in the freezer that I use in muffins and smoothies all winter long. Fantastic. I highly recommend it, as they also grow fruit well in shade, which is a rare thing. And I’ve never noticed a smell… 🙂 My chickens love them too, but I’ve never tried them on a hamster. Flying Tauranga-Auckland makes sense if you need to get to Christchurch or Queenstown, and if the timetable of your airline works, because A320s fly so much faster than any airliner that can land at Tauranga. Surely Rail to Auckland or Hamilton Airports would be better than an additional, really expensive plan?